It’s almost misleading to call the Samson Advanced a juicer; it does so much more than produce the finest juice in the world. "The best juicer is the one you will actually use"
Simply put, a juicer separates nutrient-rich juice from the fibers of fruit and vegetables, so your digestive system doesn’t have too. There are machines that do this very well and I can tell you from experience there are many more that do it poorly. A well-made juicer is almost magical—a carrot disappears and out comes fresh carrot juice. After 20 years I still enjoy the juicing process. This is the most common juicer you will see on those late-night infomercials. Produce is pushed down a chute into a spinning basket. The base of the basket has tiny teeth that grind the fruit or vegetables into a soft mush. Because the basket is spinning at a high rate, the wet mush is thrown against the side of the basket, much like wet clothes in the spin cycle. Like your laundry tub, the side of the basket is porous, allowing the mush to release its juice using centrifugal force. The dry pulp flies out the top of the basket and is directed into a pulp dispenser while the juice drains from a spigot into your waiting cup. Masticating, i.e., chewing, is a very different method. Produce is pushed down a chute into a slow-moving screw-like blade that is powered by a strong, low RPM, high-torque motor. Sometimes there are two screws working in parallel. They chew the food into a mush which is then pushed by the screw down a tapered tube, squeezing the juice from the pulp. Mesh on the bottom of the tube allows the juice to be released into a container while pulp exits the end of the tube. One of the first masticating machines was the Champion. 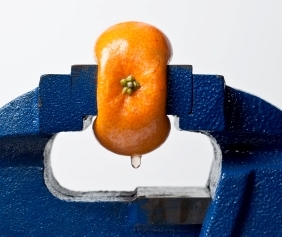 We are all familiar with the citrus press; it works on a very simple principle. Citrus fruit, such as lemon, is cut in half horizontally across its segments. The cut half is then pressed down on a reamer which has an inverted shape to the fruit. Some reamers are motorized and turn; others use long arms for leverage and you push a cup down onto the half-fruit, simply using pressure to squeeze the juice. Here’s how the debate goes. The masticating people say that centrifugal juicers spin too fast, resulting in the heating and oxidizing of juice, damaging delicate enzymes and reducing storage life. The other side believes that the chewing process of a masticating juicer releases a greater percentage of minerals from hard fibers compared to the grinding process of a centrifugal juicer. Being quite skeptical of such claims, I have searched for solid comparison studies. It’s an interesting subject because, even though a masticating juicer may not yield a greater volume of juice, if what is pouring out of the spigot is higher in nutrition and enzymes, then it’s worth paying more for a masticating machine. Some laboratory research is backing the masticating claims. There may be a greater concentration in nutrients, including minerals. Plus unlike the centrifugal juicers, the masticating type can do more than juice; it makes raw nut butter, baby food, frozen smoothies, and soup purees. So... Which one should I buy? The number-one question people ask when they are deciding which juicer to buy: Is it easy to clean? Unfortunately, our time-saving mentality will not work here. 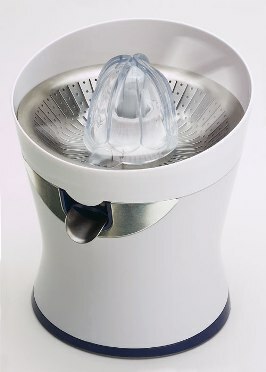 Juicers will not save you time; they may save your life, and I suppose that is time-saving in the big scheme of things. Even the best juicers are not easy to clean, but from cutting to cleaning, some are definitely better than others. It has been my experience, that because of the large hopper, strong motor and easy-to-clean design, the centrifugal type Breville Juicers are the fastest and easiest to use. "Pick the juicer you will actually use!" I used bold print because I thought it was a profound insight, which says a lot about what I think of myself; or I have been doing this for so long, I take it all far too seriously. Or I have talked to many first-time juicer owners who were all pumped about their health until the novelty of juicing wore off. I also feel the suffering of thousands of orphaned juicers, all purchased with grand promises and best intentions. In their honor, I am going to repeat myself. The best juicer is the one that gets used often enough that it has a positive impact on the owner’s health. I put this in italics because I think it was another profound insight. Know thyself, and you will save a whole lot of money on what I call good intention purchases. That is why usability tops my list of a juicer’s best qualities. Bottom line, no matter how great the machine is—it may even be able to fold your socks—if it’s hard to use, you won’t use it!